I needed a frame for a print I received at Christmas. Since I have ordered from pictureframes.com in the past, I receive emails and catalogs. In looking through the recent catalog for a frame, I saw one that I thought would look good with the print. I noticed that I could order a sample. The sample arrived shortly after ordering it and I thought it would look great. Ordered the frame, received it and perfection!!!! The print has a white background with a male and female cardinal sitting on a branch using the ink dot method. Great frame. The are simple in design an stylish, makes all image look great and doesn't take away frpm the rest of the decore in the room. My new go to frame. Very nice quality frame and an affordable price. Looks nice with a print with black lettering. My custom frame was exactly what I wanted. The frame itself arrived in perfect condition, however the acrylic and foam backing had a large hole punched through them, likely damage it received in transit. I contacted pictureframes.com and they replaced it no questions asked. Great prices, quality frames, and wonderful customer support. Well made frame. Goes nicely with cross stitch project I completed. Always happy with the products I choose from your company. This frame is deep enough for my pastel work with glass and mats and the color goes well with the fall scene that i just finished. I have been pleased with all of the frames that I have gotten from pictureframes. The color and style of the frame suited the print that I have. Hopefully it will go well with the black,tan and white wolf I painted. I like the rustic feel and it will look great with the sketch I am framing. An original etching with an aged look that a slightly distressed frame should compliment. Simple lines to this frame. I'm using them to frame molas, which are Central American fabric art, usually that has been removed from old items of clothing. They are very colorful, on a black fabric field. These black frames have a lightly sanded look, allowing the richer black of the mola backgrounds to dominate. A slightly rustic frame suits the mola's history. I purchased a piece of Aspen Art while at an outdoor market and wanted a unique type frame to show off this piece of Art Work. Had also considered Reclaimed Farm Wood, but saw this frame and felt it would compliment the piece of art more than a reclaimed wood frame. Price also seemed fair and reasonable....so I purchased. 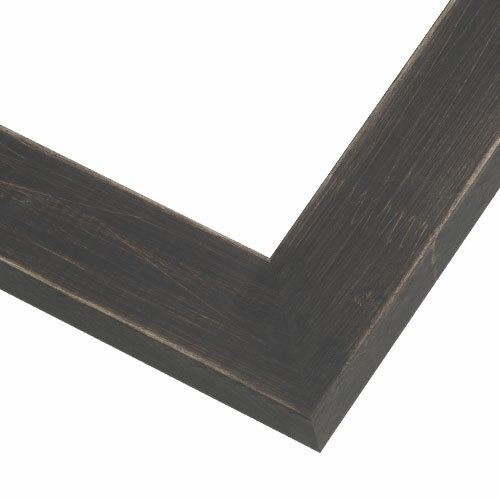 Best frame width, wood, and color for photo being framed. i am framing wildlife pictures we picked up on vacation in the mountains. This rustic wood, and the black color, looks great with all the pictures. Went nicely with needle work sampler. Have ordered frames from this company many times, and have never been disappointed. I liked the subtle 'old design' that it provides which adds value to the picture. Vintage look at a great price. a simple, unobtrusive frame profile that lets the art stand out. I needed a rustic frame for a border collie painting I did for a client and as a repeat customer, I'm always pleased with your product. Ian this Frame more black or brown?? BEST ANSWER: Much more black. From 15 feet away it reads just as black. Up close you see more of the distressed look. This frame is like a charcoal black. More black than brown I would say. Can I get acid-free foamcore backing without acrylic? BEST ANSWER: Hi Lin. You can order the foamcore without the acrylic. This would need to be done by phone at 1-800-332-8884. Thank you!